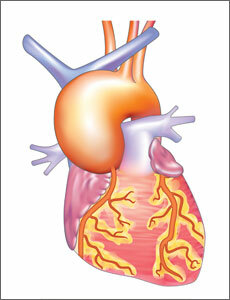 An aortic aneurysm occurs when there is a swelling of the aorta, usually caused by a weakness in the wall of the aorta. An aortic aneurysm may be treated by surgical or endovascular repair if it is growing with time or has reached critical size thresholds that mean that the aneurysm is at risk of rupture or dissection (a dangerous and life-threatening rip in the wall of the thin-walled aorta that has become weakened). Surgery for an aortic aneurysm usually involves replacing the dilated portions of the aorta, and inserting a synthetic woven tube in its place. 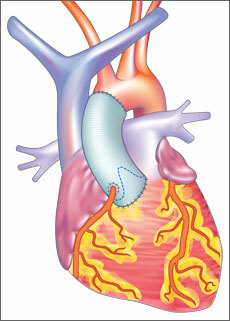 The tube is sewn into the proximal and distal portions of the aorta after excision of the aneurysmal sac. Surgery for aortic aneurysm may be approached through the breastbone (sternum) for aneurysms near the heart or aortic arch. Aneurysms in the descending aorta are typically approached through the side (ribs and abdomen). Depending on their exact location, thoracic aortic aneurysms may be treated using an endovascular procedure without conventional surgery. An endovascular stent graft is a fabric tube with a framework of metal wire mesh that reinforces the weak spot in the aorta. An endovascular stent is placed through the femoral arteries in the groin and advanced from the patient's groin up into the aortic aneurysm under special x-ray guidance to the diseased section of the aorta. 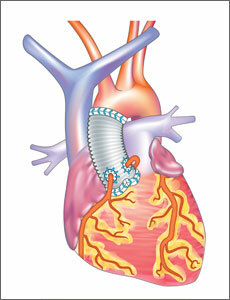 The stent seals the area above and below the aortic aneurysm, creating a "stented tunnel." The endovascular aortic stent graft allows blood to pass through the graft without putting pressure on the aneurysm. This procedure has a lower mortality rate compared to open surgical repair procedures, and is now being used in individuals with conditions that make them high risk patients for open heart surgery. MASA surgeons are regional experts in the followup of aortic aneurysm patients with a streamlined surveillance imaging program that uses CT scans or MRI to carefully measure the size of aortic aneurysms. 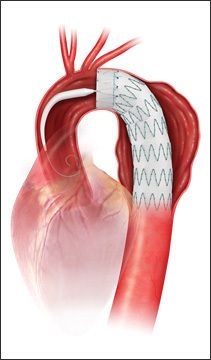 If the critical size thresholds are met requiring repair, MASA surgeons have vast experience in new open-heart surgical techniques, such as valve-sparing aortic root replacements and axillary artery cannulation. These minimize the surgical risks to patients undergoing aneurysm repair, and mean that patient's own valves may be spared without the need for valve replacement. A thoracic aortic aneurysm occurs when there is a swelling in a weakend wall of the aorta, in the area of the thorax. The principal cause of descending aortic aneurysms is atherosclerosis, while aneurysms of the aortic arch may be caused by atherosclerosis, dissection, or inflammation. The most important risk factors are hypertension and cigarette smoking, and genetic factors also contribute to aortic aneurysms. Approximately 10% of patients may have other family members who have aortic aneurysms. The standard surgical treatment for thoracic aortic aneurysms is open-chest aneurysm repair, although many aortic aneurysms can be treated with a minimally invasive surgical procedure, an endovascular stent graft. An endovascular stent graft is a fabric tube with a framework of metal wire mesh that reinforces the weak spot in the aorta. An endovascular stent is placed through the femoral arteries to the diseased section of the aorta. The stent seals the area above and below the aortic aneurysm, and the graft allows blood to pass through the graft without putting pressure on the aneurysm. This procedure has a lower mortality rate compared to open surgical repair procedures, and is now being used in individuals with conditions that make them high risk patients for open heart surgery. Aortic arch surgery involves the removal of a diseased section of the aortic arch, and replacement with a synthetic graft to restore the flow of blood through the aorta and all branch vessels. To protect the patient's brain during these procedure, the body is cooled and a supply of oxygen rich blood is supplied to the brain using a process called antegrade cerebral perfusion. These methods produce a lower risk of mortality and stroke. Some patients develop conditions that affect the aortic root, that portion of the aorta which is just above the aortic valve. This is most common in patients with Marfan syndrome, but can also be linked to high blood pressure. The diseased section of the aorta can be removed, while preserving the aortic valve. In the valve-sparing aortic root replacement procedure, the surgeon removes the ascending aorta and coronary arteries are removed just above the aortic valve, and a synthetic graft is attached with small stitches. The coronary arteries are also reattached to the synthetic graft. An advantage to the valve-sparing aortic root replacement procedure is that the patient does not need anticoagulants, or blood-thinning medications. The synthetic graft is very durable, and the patient's own aortic valve functions normally.